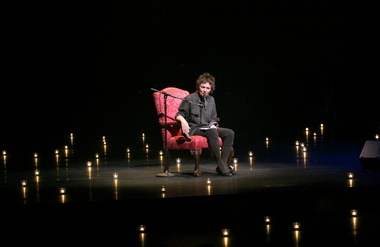 On 10/26, UCLA's Center for the Art of Performance presented Laurie Anderson at Royce Hall. As anyone familiar with her work would expect, it was not exactly a musical performance, but a performance thoroughly gilded with music. Her labyrinthine narrative/semantic skills and hypnotist delivery have clearly been focused to a powerful laser beam through the years. Those strengths were rightfully spotlighted throughout the performance, supported by her processed electric violin, keyboards, loops and samples. As I mentioned in my Vijay Iyer review, filling the massive Royce stage must be a daunting task. From my seat, Anderson looked like a little Lego woman in the distance, but that did not detract from her performance. From her stage presence and setup you could tell that this was not a new dilemma for her. The stage floor was littered with candles, adding a nice ambiance in a way that only candles can. Aside from her electronic instrument setup, the only other stage fixtures were a small rectangular projection screen and a comfortable-looking armchair. The back curtain was flooded with colored lights that slowly morphed throughout the piece, often with a single complimentary color on the projection screen adding a splash of contrast reminiscent of minimalist painting. The pacing of the show reminded me of music classes I teach to young children. One must keep a close eye on the wandering attention spans of the group, constantly jumping to something new to keep focus among the arbitrarily amused/bemused. One can't deny that Anderson has reached a deeper level of insight (or at least eloquence) than your average performer, and I imagined her as a sort of cultural babysitter or metaphorical early-childhood teacher. Her performance kept us occupied until our motor control and mental capacity are able to stumble towards the deeper resonance of the stories. Her anecdotes started broadly and became gradually more insular - beginning with evolution and space, and gradually moving towards home-made pet videos. Topics included the NDAA, space popes, tent city tree chickens, and her deceased dog Lolabelle in the bardo (even including 2 brief videos of Lolabelle playing keyboards). Her headstock-less electric violin immediately reminded me of the EWI, that most maladjusted of MIDI controllers. However, her use of effects and harmonizers created a much denser and more interesting soundscape than one would expect. The drum loops and pandiatonic pads she employed always bordered on sounding dated, toeing the line into early 90's visions of the aural future. But since the retro-kitsch tentacle is now oozing it's way through that decade, nothing felt sonically anachronic. Even when she pitch-shifted her voice to make it lower and more masculine, it sounded surprisingly clean (it reminded me of Peter Cullen's Optimus Prime voice). Her pin-point articulation helped that, aided by an apparent proficiency with the technological tools she's laid out for herself. I am still surprised when such a tech-heavy show appears to go smoothly. There is so much potential for things to go wrong, it feels like a miracle when nothing appears to have broken down by the end. Anderson has clearly gotten to know the technology that she employs, which is often quite a task for performers of more golden generations. Many artists lose their edge as they age, but Laurie Anderson fits into the other group, in which she seems to be becoming more and more herself.